Baxter prepared to step down should Bafana not beat Libya - SABC News - Breaking news, special reports, world, business, sport coverage of all South African current events. Africa's news leader. Stuart Baxter says he's in a catch 22 situation because he has to qualify for major tournaments and at the same time his other mission is to rebuild the team. 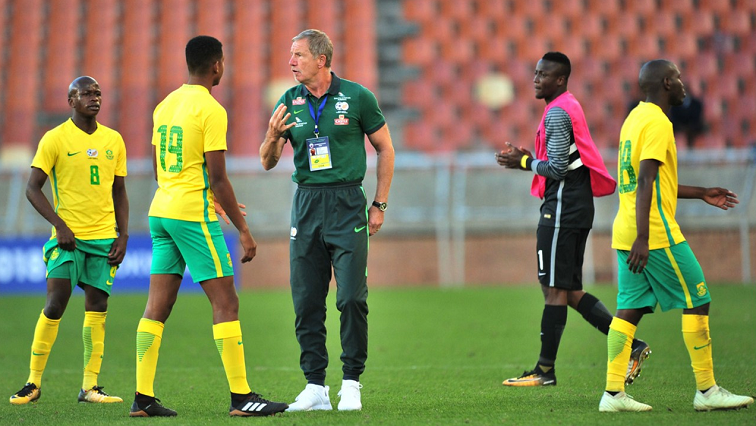 Bafana Bafana coach Stuart Baxter has reiterated his long held position that he will vacate his position if his team fails to qualify for this year’s Africa Cup of Nations (Afcon) tournament in Egypt in June. South Africa who are second in Group E, need at least a point against Libya in March to qualify for the Afcon tournament. The Englishman apologised to the nation in Polokwane in November 2017 after failing to guide the team to the 2018 FIFA World Cup in Russia. Bafana started their Afcon qualifying campaign like a house on fire by beating Nigeria away in Uyo in their opening match, but things went pear-shaped when they failed to beat Libya in Durban, in a match that ended goalless. South Africa went on to thrash minnows of Seychelles 6-0 at home, but the return fixture produced no goals on the Indian Ocean Island and that underlined Bafana’s inconsistency. Now Bafana are with their backs to the wall with just one qualifying match remaining. They must at least secure a draw against Libya away from home to finish second in the group and join Nigeria as Afcon qualifiers from Group E.
Baxter says the South African Football Association will have to convince him otherwise, if the team does not qualify. Baxter says he cannot afford to experiment in such a crucial game, and will be forced to stick with the tried and tested for the encounter. It is still not clear whether the game against Libya will be played in Egypt or Tunisia. Not even the date has been confirmed by the hosts. Bafana were in a relatively easy World Cup qualifying group, but ended up losing four games in the process. South Africa were grouped with Senegal, Burkina Faso and Cape Verde, but finished last in their group with four points. Baxter says he’s in a catch 22 situation because he has to qualify for major tournaments and at the same time his other mission is to rebuild the team. After two credible draws against Nigeria and Paraguay, Baxter says his players will have good mental strength going into the Libya match. With the return of key players such as Bongani Zungu, Keegan Dolly, Kamohelo Mokotjo, and Dean Furman, Baxter will have his strongest possible squad. The squad will be named in the first week of March. This entry was posted on 07 Feb 2019,04:13PM at 4:13 PM and is filed under Sport. You can follow any responses to this entry through the RSS 2.0 feed. Both comments and pings are currently closed.